Logbook Loans: Car Cash Point Logbook Loans range from £500 - £50,000. Motor buy back schemes offer customers loans from £500 - £10,000, however, if you only require a £500 loan and your car is worth £5000, you will need to sell the car in full in order to get the loan. Typical loans are from £500 - £1,200 maximum. Car Cash Point Logbook Loans charges 10% per month. Typical rates from 15% - 25% per month depending on the age of the car. Typical rates are from 25% - 35% per month depending on your circumstances. Car Cash Point Logbook Loans offers terms from 18-36 months. The typical term is 1 month and you are then charged for each extra month if you need to extend the loan. The typical term is 1 month maximum, you and are penanlsied if you need to extend the loan into a further month. Can I pay off sooner? 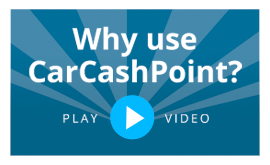 Car Cash Point provides a transparent 100% penalty free early redemption - you only pay for the time you borrow the money! Other Lenders will quote 'Discounts for early repayment' what this actually means is you would be charged interest for the full term of the contract and then given a small discount when you redeem the loan early, resulting in you paying back substantially more than you borrowed. You can Buy Back your Motor whenever you like, charges will apply and interest for the full month will be charged. You can repay your Pay Day Loan whenever you like, charges will apply and interest for the full month will be charged. What extra charges and penalties are there? Car Cash Point offers its customers no fees to set up or to repay the Logbook Loan. Early Redemption Penalties - None! Car Cash Point operates within the Consumer Credit Trade Association Code of Conduct and works with customer if they are experiencing financial difficulty to try to come to a payment arrangement. The secret to maintaining good accounts to communicate if you experience financial difficulty. It is worth noting that a Logbook loan is a secured loan and your car is secured against the loan. If you fail to make payments and ignore any request to make payments your car can be repossessed to repay the debt. This however can be easily avoided by clear communication. When you complete your Motor buy back schemes agreement you have sold your car at a massive discount. If you fail to make your payments the company will repossess their car without the need to issue default notices or obtain a court order. You have no right of redress as you have sold the car to a third party. If you do not pay your Pay Day Loan on time you will be hit with excessive penalties for late payments and contact charges. Notwithstanding, all the while the excessive interest rates charges are spiraling out of control. If you are unable to repay this debt the Pay Day Loan will seek Court Action which could result in a CCJ or even Bankruptcy. What happens if the vehicle is repossessed? The Motor Buy Back Company will sell the vehicle to recover the debt and keep all the remaining profit as they would own the car. The customer loses out! The Log Book lender will sell the vehicle at auction after 14 days. Any surpless funds would be returned to the Borrower. Who will actually own my car? The vehicle is used as security for the loan under the Bill of Sale. The ownership transfers to Car cash Point until the loan is repaid and then it reverts back to the you. The Motor buy back schemes owns your car. They purchased it at a discount and if they decide not to sell you back your car or go bust you have lost everything. The Loan is unsecured. This is why you are paying such excessive interest rates on a monthly basis. I cannot prove my income/ I am on benefits/I have a low income, can I still get money? Car Cash Point follow the Consumer Credit Trade Association 'Code of Conduct' on ethical lending and will only lend you if you can proof income and pass the a review of your income and expenditure. We do not credit check you but we need to sure you can afford to repay the debt. Motor Buy companies do not review you income and expenditure as they hope you are unable to repay the debt so they may sell the car and release the full equity. You will need to provide basic level of income and expenditure, but like Motor buy back schemes these lenders are less interested in your ability to repay rather the opportunity to charge excessive fees. The three products seem very different. How would you sum them up and which gives me the most protection? Car Cash Point offers the most flexible and best value short term loan of the three options reviewed. It gives you control to decide how long you want to borrow you loan over. Plus, it gives you to control to decide how much you want to pay and when you want to pay the loan off. Fundamentally, you have not sold the car and you are protected by the Consumer Credit Act which ensures you are ported at every stage. You have sold the car to a 3rd party who is under no obligation to sell you back your car or if the company goes bust, you have lost everything. It is worth noting, this product is not regulated under the Consumer Credit Agreement and you have no protection form the lender just repossessing their car. The excessive interest and punitive fee structure for nonpayment can make this loan very expensive if you fail to maintain payments. The term period and very short and loan amounts are typical low which provides the customer with no flexibility. You are in control, please choose the right product to suit your financial needs.